Most experienced leaders can tell you a story about the “one that got away”. The new hire that fell through at the last minute because they got a better offer, or because they got cold feet and decided to stay where they were. From research and first hand experience, we know that initiating and maintaining communication immediately after the initial job offer can help ensure your new hire makes it to their first day of work. The best way to welcome your new employee and make them feel a part of the team is with an Employee Welcome Pack. More than just a set of forms to fill in, the modern Employee Welcome Pack (also known as a New Employee Start Pack) is an entirely automated process. Delivered straight to your new hire’s inbox, it contains links to websites, wikis, blogs, company social media sites, and videos that describe and introduce your firm. The welcome message says a lot about the personality of your company. For an elegant and formal touch, you could include a video message or a personalised letter from the CEO. Alternatively if you want to reflect a more fun and youthful vibe, you could enlist the help of the entire team to create humorous GIF’s or lighthearted videos. The options are endless, so get creative. Unfortunately, forms are a necessary evil. 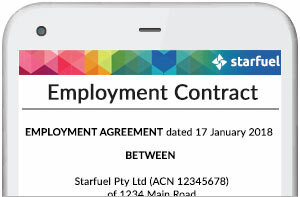 However, with onboarding software, employment paperwork can be completed, submitted and processed with minimal time and fuss. This is also a great opportunity to provide your new employee with information about the benefits and perks they can take advantage of when they come to work for you. The key here is to keep it simple. Your goal should be to paint a picture of where your company started out and where it is headed in the future (in the most interesting way possible). That said, make sure to provide links to annual reports or strategy documents for those staff who are eager to learn more. Rather than just talk about the corporate values, think of ways you can show them at work. Photos and video footage of staff are a great way to convey the company culture in action. Real people relaying real stories about their jobs and experiences with the company. Laying out the organisational map also tells your new hire a lot about your business. Is it hierarchical and structured? Or flat and fluid? Are there centralised functions? Most importantly, where does the new hire sit in this picture? Sharing the onboarding plan with the new employee demonstrates that you have thought about their learning needs and gives them confidence that they will be supported through the transition into their new job. More than that, it tells the new hire that you value them as an individual. A computer login, email account and internal social media access immediately opens up communication, helps establish connections, and promotes a sense of belonging. Imagine your employee’s delight at finding an announcement on the company’s social media page about them starting with the firm. Staff profiles help your recruit get to know their colleagues before they even start. In addition to contact details and a photo, employee profiles reveal a person’s work and educational background, areas of interest and expertise, hobbies, and recent social media activity. It is amazing what your new hire will find they already have in common to talk about with their new team members. what they should bring on the first day. Send your new hire a survey about their experience so far. Once again this will reinforce that you care about them as an individual and value their feedback. 90% of employees make the decision to stay with a company within the first year, so it’s vital to ensure onboarding is effective to reinforce engagement from day one. Onboarding Tasks You Shouldn’t Wait To Automate Onboarding. Turning the tables on the traditional induction.